Imagine being at the office and receiving an alert if you left your garage or gate open. Or being able to turn on your lights before they get home. The Liftmaster 828LM Internet Gateway, which connects to your router and enables smartphone control, does this by letting you monitor, open and close their garage door or gate from anywhere and control home lighting. MyQ Technology enables you to securely monitor and control your garage door opener, gate operator and home lighting with a smartphone, tablet or computer. Alerts can be received as email or pop-up (push) notifications on your mobile device so that you always know the status of your garage door, gate operator and home lighting. Turns opener lights on/off from inside the garage. Easily program remote controls and MyQ Accessories directly from the control panel. Timer-to-Close feature allows the door to automatically close after a preprogrammed number of minutes. Motion detector automatically turns on garage door opener lights when movement is sensed. Adjustable light timer lets you set when you want the opener lights to go out after closing or opening the garage door. Alert-2-Close warning system provides audible and visual warnings when the garage door is about to close when using MyQ Technology or Timer-to Close. Enables you to monitor and close up to four garage doors or gates from any room in your house. Does not require the LiftMaster 828LM Internet Gateway. Replaces your existing wall switch to allow you to control home lighting with your garage door opener remote control or smartphone via MyQ Garage or LiftMaster 828LM Internet Gateway. If you're always on the go, the LiftMaster 890MAX 3-Button Mini Remote Control will fit your busy lifestyle. It's small enough to fit right on your keychain, or in your purse or pocket, so you'll always have it when you come home. It can control up to three garage door openers or gate operators, or MyQ® enabled light accessories. For added safety, it features Security+2.0 rolling code technology that virtually eliminates interference and sends a brand new code every time it is used. Fits in purse, pocket or on a key chain. Can control up to three garage door openers, gate operators or MyQ® enabled light accessories. Features Security+2.0 rolling code technology that virtually eliminates radio wave interference. Compatible with all LiftMaster® garage door openers manufactured since January 1993, and all 315MHz Security+® LiftMaster and Elite® gate operators. New Liftmaster 890MAX Mini Key Chain Remote Control. Program three different Lift Master remotes into one unit. Works on all Liftmaster, Chamberlain, Sears units from 1993 to present. Compatible with all LiftMaster garage door openers manufactured since January 1993, and all 315MHz Security+ LiftMaster and Elite gate operators. This remote will work with all Sears Craftsman, Chamberlain, and Liftmaster Garage Door Openers that have either a green, red, or purple learn button. Gone are the days of wondering if you put the door down or worrying over the kids forgetting their keys. Now, any LiftMaster® garage door opener manufactured since 1998 can be controlled with your smartphone, tablet or computer thanks to the new 888LM MyQ® Control Panel (when paired with the 828LM LiftMaster® Internet Gateway, sold separately). MyQ® technology enables you to manage, monitor and control everything from your garage door opener to lights and beyond anytime, and from anywhere. It also allows for simple programming of new MyQ® Accessories and Security+ 2.0 remote controls and keyless entry products and features Timer-to-Close, that automatically closes the garage door after a pre-programmed number of minutes making it easy if you have your hands full. You can also purchase the MyQ® Control Panel and the LiftMaster® Internet Gateway together in the MyQ® Package. Equipped with a 150º sensing angle. On/Off switch for deactivation of motion-detecting function. Adjustable light timer lets you set when you want the opener lights to go out after closing or opening the garage door (pre-set at 4 1/2 minutes). Timer-to-Close feature allows the door to automatically close after a pre-programmed number of minutes. Easily program remote controls and MyQ® enabled accessories directly from the control panel. LiftMaster® Internet Gateway accessory required (sold separately) to utilize MyQ® functionality. Locks out all outside remote control signals while you're away. The MyQ 888LM MyQ Control Panel is intended to be installed with Security Garage Door Openers manufactured between 1998 and present. The MyQ® Control Panel is NOT compatible with Security 2.0 Garage Door Openers. DO NOT install this door control on garage door opener systems controlling one-piece or swing doors. The MyQ® Control Panel offers a quick and convenient way to add Security 2.0 and MyQ® technology to your existing garage door opener. MyQ® technology uses a 900MHz signal to provide two-way communication between the garage door opener and MyQ® enabled accessories. When programmed to the Liftmaster 888LM MyQ Control Panel Internet Gateway you can monitor and control your garage door from any internet enabled computer or smartphone. You may program up to 12 Security 2.0 remote controls, 2 Security 2.0 keyless entries and a combination of 16 MyQ® accessories to the MyQ® control panel. - Model 891LM 1- Button Remote Control. - Model 823LM Remote Light Switch. - Model 893LM 3-Button Remote Control. - Model 825LM Remote Light Control. - Model 890MAX 3-Button Mini MAX Remote Control. - Model 828LM LiftMaster® Internet Gateway. - Model 893MAX 3-Button MAX Remote Control. - Model 829LM Garage Door and Gate Monitor. - Model 895MAX 3-Button Premium MAX Remote Control. 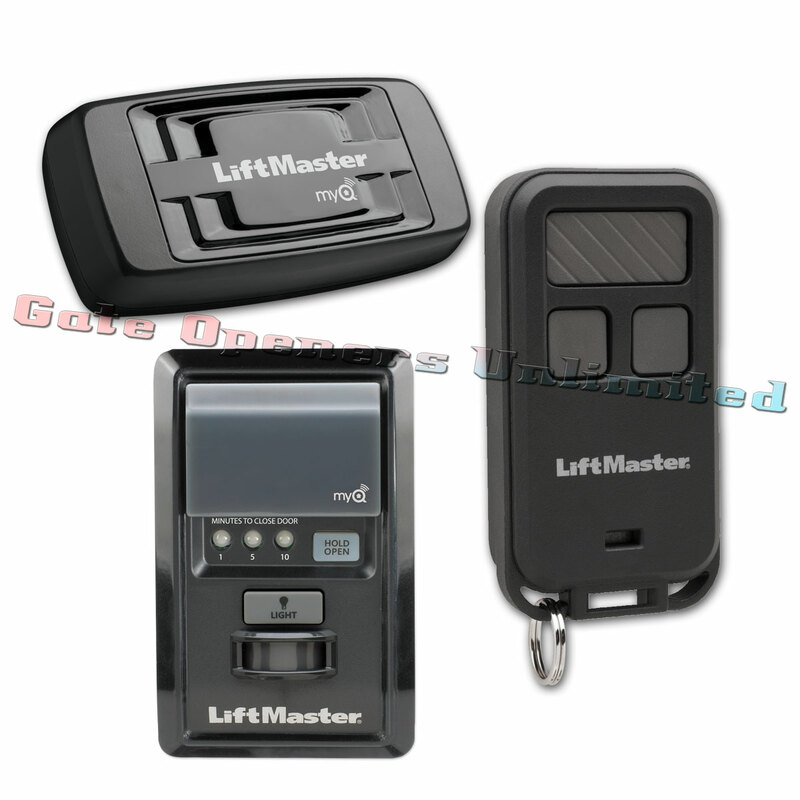 - Model 877LM Wireless Keyless Entry. - Model 877MAX Wireless MAX Keyless Entry.